This book was very entertaining and can open the reader's mind to consider that things aren't always what they seem. It's not a serious economics book and as an economist fried of mine said, it "shouldn't be used in forming any fact based conclusions". Twas written by a liberal economist, which in my opinion, is an oxymoron. 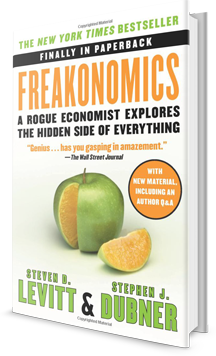 I very much enjoyed reading the book but am agitated at the amount of people that see it as a legitimate book on economics.